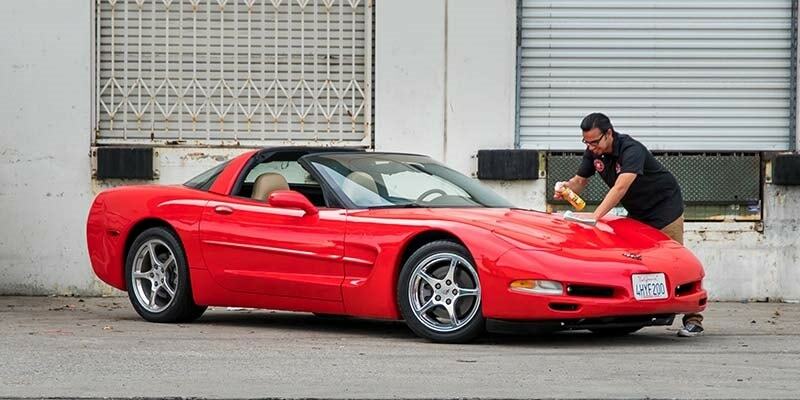 Provides wet, deep finish to any color paintwork. Developed for paintwork, glass, and clear plastics to provide shine and protection. Protects against harmful UV rays, pollution, contamination, and water spots. Easy spray on, wipe off formula. Formulated with refined carnauba for the ultimate shine. 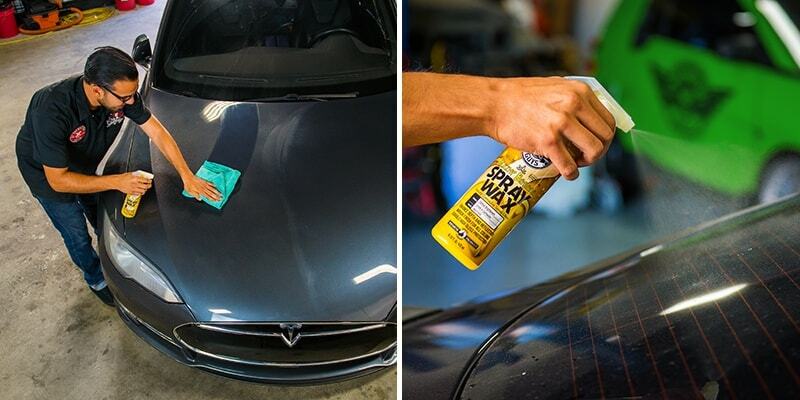 Chemical Guys Blazin’ Banana Spray Wax will change the way you wax your car forever! Blazin’ Banana brings the shine in half the time. Give your vehicle the brilliant shine, reflection and feel of a just-waxed carnauba finish, just spray and wipe. It’s bananas - a liquid car wax you simply spray on. Spray it on anytime for a fast shine or use right after you wash, while the surface is wet, as you dry for a popping brilliant shine. Chemical Guys Blazin’ Banana Spray Wax gives you the control to keep your car looking amazing with a deep, glossy shineanywhere you may be. While traditional paste and cream waxes are time-consuming to apply, the application process of Blazin’ Banana Spray Wax merely takes a few seconds with every spray. 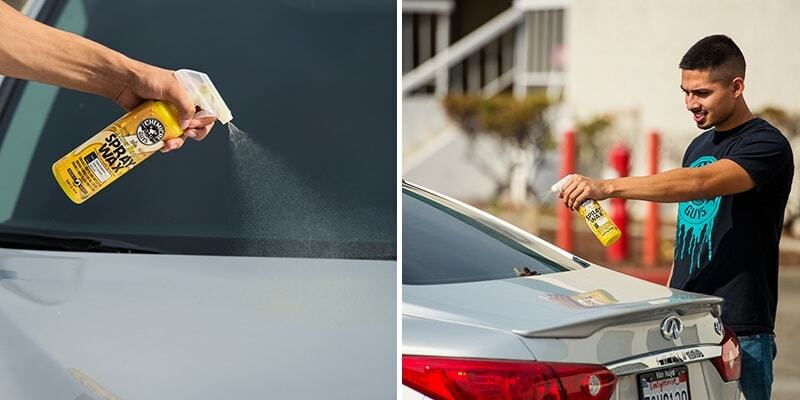 Now, everywhere you go, your car rules the streets as contamination slips off of the paint with the power of Chemical Guys Blazin’ Banana Spray Wax. Everyone’s favorite carnauba wax has now been paired with the slickness of a banana to create the ultimate blend, Chemical Guys Blazin’ Banana Spray Wax. Two of the biggest superpowers of shine are now at your fingertips and just seconds away from anointing your vehicle the king of shine. Carnauba has always been the go to for enthusiasts and detailerslooking for the warm, deep, natural shine to paintwork. Blazin’ Banana Spray Wax is formulated using premium refined carnauba to bring out the slick shine in any color paintwork. 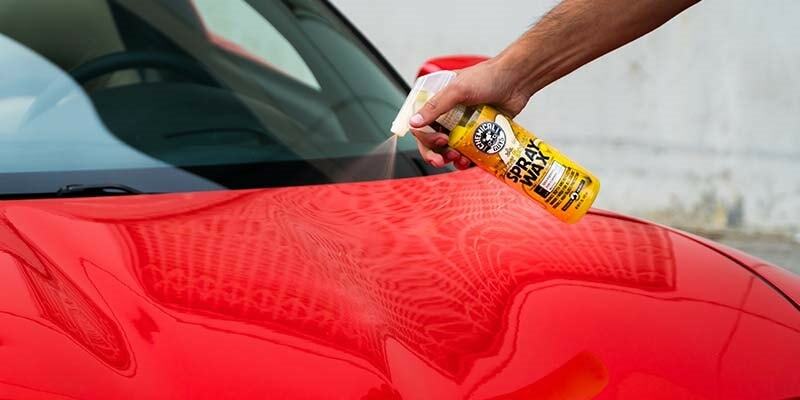 The ultra refined carnauba in Blazin’ Banana Spray Wax provides a protective layer creating a hydrophobic finish for the ultimate water beading off your vehicle’s surface. 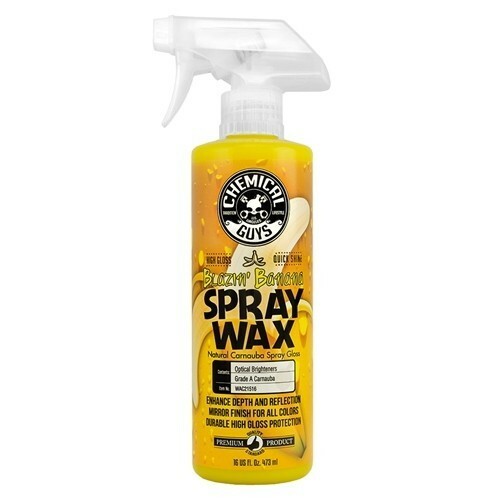 Simply spray Blazin Banana Spray Wax onto painted surfaces, glass, metalwork, clear plastics, wheels, even headlights to deepen shine and add protection. Applying wax can be time-consuming and living in this day and age, time is definitely money. Blazin’ Banana Spray Wax allows you the luxury of extra time on your hands by being a simple way of providing your car with a deep wet shine in seconds! Unlike traditional cream and paste waxes, Blazin’ Banana Spray Wax can be immediately removed after application to reveal a glossy slick finish like no other. 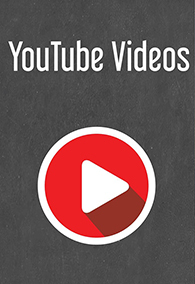 Traditional liquid and paste waxes can be messy and take time to spread evenly across the surface of your vehicle. With Blazin’ Banana Spray Wax you can easily spray it onto the surface for a nice even coverage every time. Give your car the same protection as traditional paste waxes, with the easy to use slickening shine of Blazin’ Banana Spray Wax. The incredible fresh banana scent of Blazin’ Banana will grab your attention as much as the slick shine it leaves behind. Blazin’ Banana Spray Wax gets really friendly with your exterior surfaces, that it literally bonds and cures to the surface. A friendship like this can only mean the clingiest and most overprotective friend you can ask for. Blazin’ Banana Spray Wax will ensure that your vehicle is protected by providing a durable protection against the road’s toughest debris. Blazin’ Banana Spray Wax offers protection from harmful airborne pollution, contamination, and water spots in mere seconds. 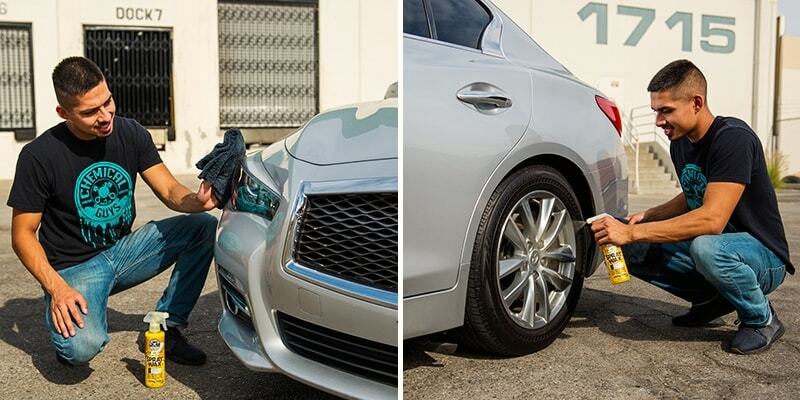 The car is now sealed against the elements with a premium warm shine that can last you months. Wipe and Buff off residue with premium microfiber towel.